Usual Lead Time is 8-10 Weeks. CBC-Heavy duty ships LTL Freight Collect. This heavy duty series CBC-HD-1x1 model CoilBridge conveyor is ideal for heavy duty coil fed press a.. 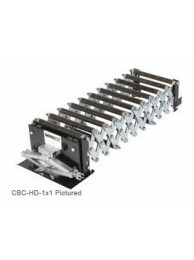 This heavy duty series CBC-HD-1x2 model CoilBridge conveyor is ideal for heavy duty coil fed press a.. This heavy duty series CBC-HD-2x1 model conveyor is ideal for heavy duty coil fed press applications.. This heavy duty series CBC-HD-2x2 model CoilBridge conveyor is ideal for heavy duty coil fed press a.. This heavy duty series CBC-HD-3x1 model CoilBridge conveyor is ideal for heavy duty coil fed press a.. This heavy duty series CBC-HD-3x2 model CoilBridge conveyor is ideal for heavy duty coil fed press a..